With the large-scale construction of high-speed railway bridges, monitoring their settlement has become an increasingly important task to ensure the safe operation of a high-speed railway. This paper presents a case study of a 100-km-long portion of an intelligent settlement monitoring system for the high-speed railway bridges (SMAIS) of the Beijing–Shanghai railway. The SMAIS consists of a sensor subsystem (SS), data acquisition and transmission subsystem (DAQ), data processing and analysis subsystem (DPA), database subsystem (DB), and data display and early warning subsystem (DEW). The SMAIS has the advantages of modularisation, low coupling, and interface standardisation. 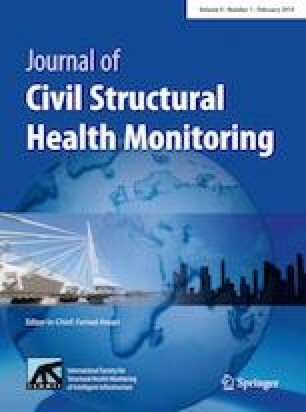 The general design principles of the SMAIS were studied, including its monitoring range calculation, monitoring point positions, and early warning threshold value determination. Proposals are made for the design of the SMAIS architecture and functions of its subsystems. The installation process and standard techniques for the SMAIS are also presented. The sensor precision test, temperature stability test, and general monitoring results are presented. An advanced continuous median data filtering-algorithm that considers the vehicle influence and error transmission is proposed.